Intel Android USB Driver allows you to connect your Intel Atom processor Based Android Devices to the computer without the need of installing any PC Suite Application. 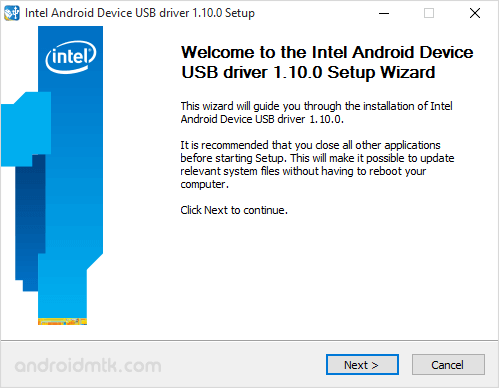 Here, on this page we have managed to share the latest version of Intel Android USB Drivers along with the previous versions. The size of the driver package is approximately 9 MB only and comes as installer. Simply Download the driver package and open it, and follow the screen instructions to quickly install it on the computer. Intel Android USB Drivers works only for the devices having Intel Atom processor. It will not work on devices having other chipset other than Intel Atom processor. Intel Android USB Drivers is only available for Windows Computer. With the support to Windows XP, Windows Vista, Windows 7, Windows 8, Windows 8.1 and Windows 10. There is no official Intel Android Driver for Linux Computer and Mac Computer. [*] The Driver will only work for the devices having Intel Atom processor. If you are trying to install the Driver for any other Chipsets, then it wont work for you. [*] Compatibility: Intel USB Driver supports Windows Computer Only, including Windows XP, Windows Vista, Windows 7, Windows 8, Windows 8.1 and Windows 10. It only supports x32 Bit version not x64 Bit version of Windows XP computer. [*] If you are using older version of Intel Android USB drivers then you may face compatibility Issue on Windows 8 and 8.1. To fix this you need to run the setup under compatibility mode set for Windows XP. [*] Credits: Intel Android USB Driver is created and free distributed by Intel, LLC. So, full credits goes to them for sharing the USB Driver for free.